Giles, Good choice in the end with the black. Crunchy kitty. I struggle with my dependence on pens, also. Forcing yourself to work with brushes can be frustrating and a little anxiety-producing (especially when you’re concernced with messing up a piece). Good luck with it! Your black kitty is my favorite part of the whole picture. Great picture. The cat looks a bit “disturbed” to put it nicely. Sitting on a rocket like that – no wonder… Very personable work. And your brushes are very neat and clean, unlike mine. Ok. I hope I’ll pass the numbers test this time… here goes. I not speak english sorry!! Your interesting designs are a lot!!! Rock On Cat on a rocket. It is beautifully done. wowie! 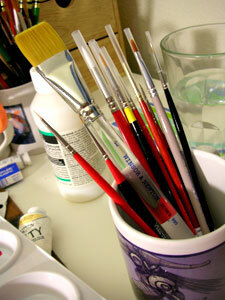 id love to have as many as those paintbrush too! mommy!!!!! Lovely cat, great to have it going out in style, red and all! Great illustrations Ã¢â‚¬â€œ I browsed your blogÃ¢â‚¬Â¦ Lily. Rarely uses black paint! Imagine that! I love this illo! Too fun and so colorful! It looks like you painted the cat on glass, it has a great texture to it! Sure is frustrated to see. Nice work and keep up with the brushes. I buy new sets regularly, partly because i donÃ‚Â´t treat them nice. Anyway, great cat going on a big mission! Awww, I think your kitty is adorable .. and you have such a refreshing and unique style. I enjoyed navigating through some of your other pieces. Very cool. 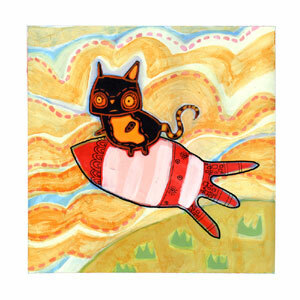 Kitten on a rocket – I love it! Lovely choice of colors. Your characters are adorable. Great illos on your blog – WOW! not only do I love the cat on a rocket (brilliant! just brilliant! ), but I love that even your most basic subject matter takes on a whole whimsical life of its own. you have a whole universe going on. I’m glad to have the opportunity to visit it (I’d move here but I have to see how the housing market it). it reminds me of molas. nice web! really cool! and nice cat!! !